Now, in addition to our fantastic selection of photography, you can also order fine art available exclusively as custom prints. 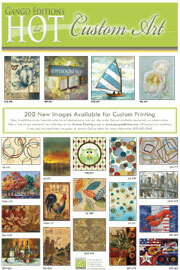 Take a look at our wonderful new offerings on our Custom Printing Page. All images are available in any size you need them, on paper or canvas. Simply find an image you like and let us know the dimensions and medium (velvet paper, photo paper, matte paper, canvas) and we’ll create a custom product to suit your needs. The sky is the limit. Give us a call at 800-852-3662 for more information and substrate samples.